Let's say you have an important question for a co-worker and have stopped by her office multiple times only to find her in a meeting or away. It's inefficient to continually walk by the office, so how can you talk to her as soon as she becomes available without having to schedule a special meeting? 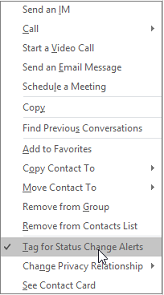 Skype for Business includes a tagging feature that allows you to tag people for alerts when their status changes. The alert is a pop-up on your screen with the contact's picture and a message that tells you the status has changed. If the person you've tagged isn't already in your contacts list, they'll be added to it. Go to your contacts list or use the search field to find the person you want to tag. Right-click their contact information and select Tag for Status Change Alerts. If you no longer need to be notified of a person's status changes, you can untag them to stop the alerts. There are two ways to untag a contact. Either click Untag when the alert pops up or follow the steps below. Go to your contacts list. Right-click the person's contact information. and select Tag for Status Change Alerts. Note the checkmark next to Tag for Status Change Alerts. Click it to untag the contact.